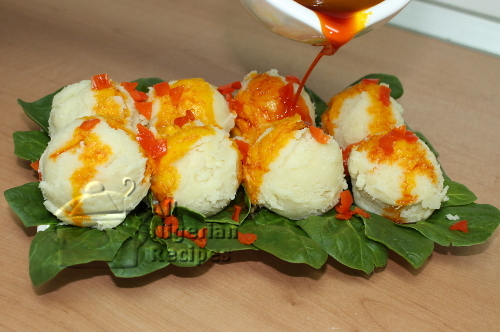 Ji Mmanu is simply boiled yam served with palm oil. Some pepper and ukpaka may be added to the oil but usually, it is simply palm oil and salt. This one is prepared specially for Easter. If using unsalted butter, add salt. If using salted butter, the salt from it is enough for the stated quantity of yam. This recipe assumes that you have washed all the ingredients thoroughly before using them. De-seed and cut the habanero pepper into tiny pieces. Cut about 3 leaves of the spinach or garden egg leaves into very tiny pieces. If your palm oil is congealed, melt it. Do not heat it up, just melt it. Peel and cut the white puna yam into small pieces. Rinse them and put in a pot. Pour water to just under the level of the yams. The plan is to have just a small quantity of water left in the pot by the time the pieces of yam are well cooked. Add chunks of onion. I want to have onion flavour in the meal but I do not want to have pieces of onions in there that's why I use chunks here. Add salted butter. If you use unsalted butter then you will need to add salt when the contents boil. Cover and start cooking on high heat. After about 20 minutes, the yam should be well cooked with a small amount of water left in it. Remove the chunks of onion, turn off the heat and set the pot aside for the yams to cool down a bit. Mash the yam with a potato masher or any utensil that can do the job. You can use a pestle but do not mash it into a smooth paste like pounded yam. After using the potato masher, follow it up with a spatula. The spatula helps make the dough smoother. Do not be tempted to add more water because this is not pounded yam. You want the yam mashed but it should still have the texture of a boiled piece of yam. When the dough becomes a smooth, use an ice cream spoon to make balls of the dough. Place the scoops of yam on a bed of spinach or garden egg leaves. Sprinkle the pepper and pour the palm oil over the balls of yam. Spread the tiny pieces of spinach on top for effects. Serve with a chilled drink.